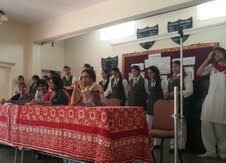 The NDS teachers took advantage of this meeting to have an interactive session with the girls. They talked to them about the purpose of the club, the fact that plays this year could be street-plays, one-act plays and then of course, the annual play. The teachers encouraged the members to come up with ideas for the annual play. They encouraged them to research for plays in the vernacular languages as well. So avid was the interest that the members stayed back after school to discuss with the teacher the ideas that were bubbling in them. This irrepressible enthusiasm augers well for this NDS year.